With the mayhem inevitable in a movie about a war kept gore-free and only minor blemishes on the dialogue, parents may be more concerned about the nonscriptural notions centering on the famous Force that are here collectively referred to as the "Jedi religion." Teens able to take this fictional faith, a sort of dime-store Taoism, as just one more element in a fantasy world will benefit from lessons about the value of hope and the true nature of heroism. The "Star Wars" saga has often been characterized as the Iliad of contemporary culture. So perhaps it's fitting that the opening of writer-director Rian Johnson's eighth episode of the narrative initiated by George Lucas in 1977 finds Luke Skywalker (Mark Hamill) imitating Homer's Achilles by holding aloof from the great struggle in which he once took an active part. Rather than sulking in his tent, as Achilles did, Luke is leading a solitary life of self-imposed exile among the small stone huts of a distant planet. (These scenes were shot on the Irish island of Skellig Michael, site of a medieval monastery.) 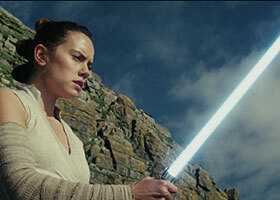 His isolation is interrupted by the arrival of Rey (Daisy Ridley) who has come as a messenger from Luke's twin sister, Leia (the late Carrie Fisher). As the leading general of the embattled Resistance — the latter-day version of the Rebel Alliance for which Luke once fought — Leia urgently needs her brother's famed skills as a warrior if the struggle against the fascistic First Order (successor to the evil Galactic Empire), and its malignant leader, Snoke (Andy Serkis), is to continue. Luke refuses to join the conflict. But he does agree to train Rey in the ways of the Force. 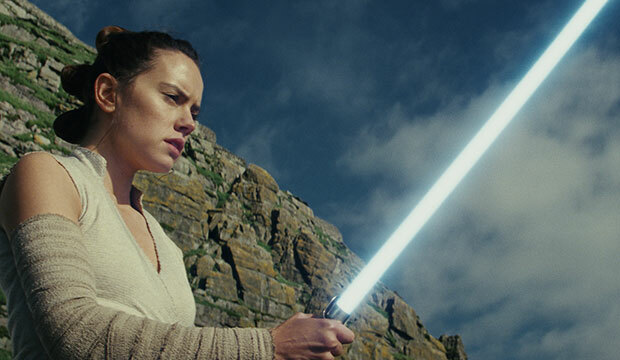 Rey will need the power of this mysterious spiritual energy, the source of Luke's own prowess, when she eventually confronts Leia's son, Ben Solo, aka Kylo Ren (Adam Driver). Originally a good person, Ben has gone over to the side of darkness, and now serves as Snoke's chief lieutenant. Even so, he still has some elements of good remaining in him, and his ongoing moral struggle has the potential to sway the outcome of the intergalactic battle. Though it gets off to a slow start, once it hits its stride "The Last Jedi" sweeps viewers along with stirring action and audience-pleasing plot twists. While not as taut as last year's "Rogue One: A Star Wars Story," this sprawling installment of the great franchise makes, in the end, for a more memorable experience. The script's portrayal of the Force as capable of endowing those who cultivate it either with goodness or iniquity may strike moviegoers of faith as establishing a false equivalence of power between these two poles of morality. Some may even see in this an implicit denial of the rule of divine providence and God's ultimate supremacy over sin. Yet, in keeping with a Christian worldview, characters do make their ethical choices more or less freely. And the idea that a change in basic identity should be reflected by a change of name echoes a recurring trope in Scripture — and in the church's sacramental practice. Audience members young or old are unlikely to spend much time meditating on these aspects of the picture, however. Instead, they'll be content to ride this cinematic whirlwind while it lasts, and leave its mythos behind them like so much popcorn on the theater floor.